"It's not a question of if air capture technology will be adopted; it's a question of when," said Klaus Lackner, director of the Lenfest Center for Sustainable Energy at Columbia University's Earth Institute. Lenfest Center for Sustainable Energy Director Klaus Lackner. Photo courtesy of Global Research Technologies LLC. Carbon capture from the air works in a somewhat similar way to carbon capture and storage (CCS) technology used to reduce carbon emissions from power plants. One of the main differences is that air capture doesn't have to take place in or close to industrial facilities. Air capture is also a more challenging process because carbon dioxide is much more diluted in the atmosphere, so structures to remove the gas would have to process much higher volumes of air. Finding ways to reduce carbon emissions is important because they are a major contributor to global warming. Atmospheric CO2 made up over three-quarters of all human-caused greenhouse gases in 2010, and the concentration of the gas is continuing to increase, according to a 2014 report by the Intergovernmental Panel on Climate Change. Lackner's optimism about the future of air capture is not widely shared. Since 1999, Lackner has been working on convincing scientists, policymakers and investors that air capture technology has the potential to play a leading role in combating global warming. Lackner made his case for air capture technology at a small presentation hosted by the U.S. Energy Association in Washington, D.C., on Tuesday. "I do realize that air capture is on some level controversial," Lackner said. But he said trees provide an example of air capture in nature, "and we have to figure this out." Most scientists agree that the world will start seeing more adverse effects of warming once global temperatures reach 2 degrees Celsius above preindustrial levels. That's roughly equivalent to an atmospheric CO2 concentration of 450 parts per million. The planet may be less than 25 years away from reaching that level, and emissions are still accelerating, said Lackner. Finding a way to take carbon dioxide out of the atmosphere is essential if people continue to rely on fossil fuels for energy and want to avoid the negative global effects of rising temperatures, he said. A laboratory-scale CO2 removal device. A bladeless fan pushes air through coiled filters embedded in the white supporting structure, binding the CO2. Photo courtesy of Klaus Lackner. He has been developing his own system for nearly a decade and says he has a successful prototype that he will soon be testing extensively outside the laboratory. 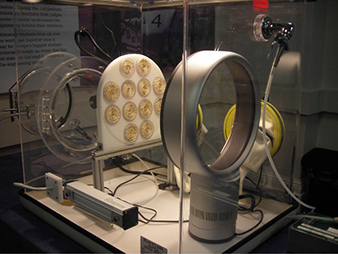 In the laboratory model, a fan pushes air through coils of dry resin filters with openings the size of drinking straws. As the air passes through, the CO2 interacts with carbonate and hydroxide in the resin walls, forming bicarbonate. When the filters become fully saturated, they are recharged by stacking the coils like poker chips in a glass tube. Water is poured over them, causing a chemical reaction that releases the CO2 gas into the tube. From there, the CO2 could be stored as a gas or compressed into a liquid for storage. Much of the energy cost associated with air capture would come from converting the gas to a liquid, said Lackner. So far, his team has found the prototype works best in very dry desert conditions. It is currently working on getting commercial backing to further its research. 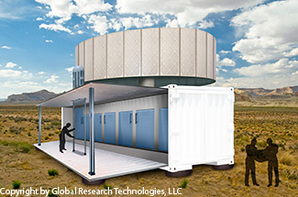 The air capture facility would be about the size of a small house, with the ability to capture 1 ton of carbon per day. The coiled filters will be placed in panels that are 3 feet wide by 7.5 feet tall. These panels, about 30 in all, would rotate on the top of the building structure. This would allow air to passively flow through the filters. As the filters reach their saturation point, a robotic device would remove the panel and bring it to a storage box below where the filters would be recharged and a fresh panel would be put up in its place. In order to achieve negative emissions, there would need to be about 100 million of his 1-ton-per-day structures worldwide. The resulting carbon dioxide could be buried underground or used for industrial purposes like exploratory oil drilling or in commercial greenhouses. There is also some research into using the gas as an alternative energy source. Artist's rendering of what a full-scale carbon dioxide removal device would look like. Photo courtesy of Global Research Technologies LLC. Lackner is not the only scientist investigating air capture methods. Greg Rau, a visiting scientist at the Lawrence Livermore National Laboratory, has developed an alternative method using saline water electrolysis (ClimateWire, May 29, 2013). Critics of air capture have said the current technology is not economically feasible. High cost estimates predict the process could range from $600 to capture 1 ton of carbon to Lackner's own estimate of $1,000 per ton. In order for the technology to be feasible, the price would likely have to fall below $100 to capture a ton of carbon, Lackner said. Some critics have questioned whether it would not simply be easier to plant more forests to do the job, rather than spend money developing new technologies (ClimateWire, April 16). Lackner countered that the sheer amount of carbon dioxide that has to be taken out of the atmosphere is too much for biomass alone to handle. Air capture of CO2 is about 10 to 20 times more efficient than capture by trees and other photosynthesizing organisms, he said. He compared the current advancement of the field to windmills in the 1950s. Over the second half of the 20th century, the technology improved dramatically, and the price of producing wind power dropped fortyfold. Lackner anticipated a similar trajectory for air capture technology, though he would not speculate on the potential cost. "In terms of economic viability, I don't know the answer to that; the cost of future technology is completely unpredictable," he said.